We woke to no power on Saturday. We were rather unhappy about that. We got dressed and headed out for breakfast. We stopped at three McDonald's until we found one open. The storm was that bad. But breakfast was pretty good. We all ate for about $11. We picked up the tire. (It's a tight fit for the kids in the car.) Kade had a game. That was a nice distraction. Mickey took his dad to see "Iron Man 2". The kids and I hung out at my parents' house. They had power. Then we came home and went to bed after getting dinner. oh man!! did you spend tons of time at families houses or did you stay home? we did a little of everything... but last night had enough and went to a hotel. 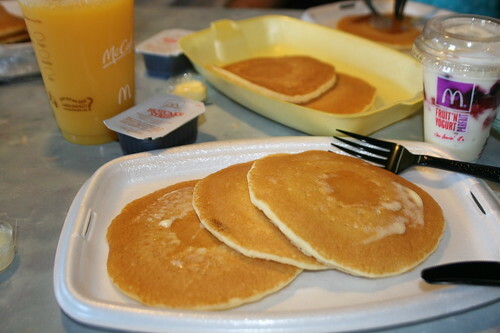 We also had breakfast at mcdonalds... and the lines were so long! We got ours back today before lunch. I thought I was going to go mad. Arent you glad its all over now... geesh.